Albéniz's "Rapsodia Española," in its piano solo version, is available for the first time on CD. With other works rarely recorded, like "Valses Poéticos" and "Mallorca", ESPAÑOLA regroups two of the most popular suites by Albéniz and Granados. With its seductive melodies and evocative titles, this hearty double CD will please the latin music amateur as well as the classical connoisseurs. 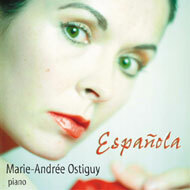 Played by Marie-Andrée Ostiguy and realized by Henri Brassard, this album was recorded in Québec, at the Saint-Hilaire church, on June 9 and 10, 1999, on the Yamaha CFIIIS piano.